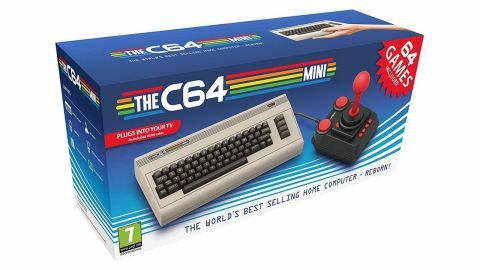 C64 Mini review: "A charming package that falls just short of greatness"
I don't have a particularly deep well of nostalgia for the Commodore 64. Though Retro Games Ltd., makers of the C64 Mini, are quick to point out that it's the best selling home computer of all time, for me it's a weird machine that lived in a dusty room at my friend's house, something we'd play occasionally when it was too rainy out to run around, before the NES arrived and swept all those other early computer and game systems into the farthest corners of our minds. It's a good thing, then, that the C64 Mini isn't purely a nostalgia play. While those with a great reservoir of affection for the original will no doubt be transported into the past by the beige keyboard shell and the beautiful, vivid red and black joystick, even those who have no memory of the C64 can find some joy in this tiny, charming package, fun not entirely dampened by some unfortunate features (or lack thereof). For a roundup of all our favorite throwback consoles, check out our list of the best retro consoles. Following in the footsteps of the wildly successful NES and SNES Classics, the C64 Mini is a tiny version of the original, and the miniature aesthetic works here as well as it did for Nintendo. Both the main console, which mimics the original C64's keyboard, and the included joystick look great, and if you're buying the Mini mostly as a display piece it's very easy to recommend. The plastic feels sturdy and solid, another way the unit recalls the early days of computing back when PCs looked incredibly heavy and were in reality even heavier. At a distance, the C64 Mini looks faithful and very cool. When you get a little closer, though, there are a few niggling issues which mar the overall design. The keys on the console don't depress at all, they're just solid little immovable chiclets. This isn't a huge deal, and I certainly didn't expect to be able to input through the top of the console (though that would've been wonderful), but it is disappointing. It looks like such a tactile piece of tech your natural instinct is to play with it, but in reality it's mostly just a hard plastic shell, albeit an attractive one. The joystick is a decent size for perching on an armrest or in your lap while you play, though a wider base would've been welcome for a little more stability. Unfortunately, the stick is extremely stiff, and has a very limited range of movement. I haven't had my hands on an original C64 joystick in far too long to remember if this is a nod to the original, but if that's the case I would've been happy to stray from the 1982 blueprint. It makes any kind of precise movements in games extremely fidgety and difficult, and given how exacting and demanding some of the games loaded on the system are this is a pretty significant drawback. It does feel very distinct from modern inputs in a somewhat pleasant way, but the net result is a lot of frustration and the feeling you're walking on eggshells, that you have to be extremely careful and mindful when making small movements. It's not the feeling you want when recalling your raucous youth. The 64 games included with the Mini are an interesting selection. Without speculating about licensing issues, it's a shame that some of the best remembered games from the original are missing, titles like Wasteland or Elite that wowed players in the 80s with their complexity and depth. But the games that are available run the gamut of genres, and I found myself enjoying even some of the more obscure games that I'd never played before (once I'd gotten more used to the eccentricities of the joystick). There are few things as fun as slapping a big, dumb red button to blast tiny ships out of a pixelated skybox in Zynaps, or hurl deadly fistfuls of shuriken in Avenger. The C64 wasn't a machine known for a library of killer apps, and the diffuse nature of buying games in the early 80s meant that every store was likely to have a significantly varied, almost random selection. That said, there are some recognizable titles included with the Mini, early hits like California Games or Paradroid that most owners of the original are likely to remember fondly. The best thing about the games chosen for the Mini, though, is that they largely hold up, that there's a lot of fun to be had here even for jaded modern gamers. The simple appeal of puzzle platformers or scrolling schmups hasn't faded much with age - if anything, we're in a renaissance of just those genres. And some of the games are surprisingly deep and engaging, like the naval sim Destroyer. Perhaps where the C64 Mini suffers most are in the details, the little touches that could propel a proposition like a throwback console from novelty buy to must own. The included power cable is USB only, and doesn't include an AC adaptor, for instance, and the system doesn't include any manuals either in software or inside the box (manuals have to be accessed via the manufacturer's website). While a lot of the included games are pretty self explanatory, going in blind to something like California Games or Destroyer is a recipe for instant failure. There is a decent suite of display options, if you crave the scanlines of a CRT or a retro aspect ratio, and a suspend function and save states for resuming your games. The C64 Mini sits right on the brink of being a really great, complete package, and for collectors of those who remember the original home computer with tremendous fondness it's really easy to recommend. For everyone else, it's a dicier proposition, and mostly comes down to how much you want to plumb the depths of this slice of the C64's catalogue, or exhibit this adorable little console on your shelf.